"Wrong Way' Corrigan, an early aviator, used the ruse that he was lost when he landed in Ireland rather than California. (see sidebar) Alan and I could not make the same claim that we were lost by design. This is the story of our "wrong way" trip up the Turner River. 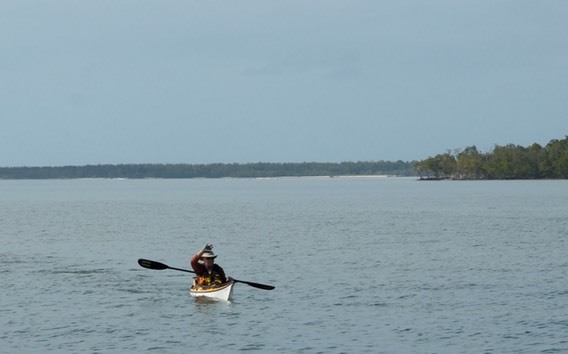 February 22, 2013: After Bruce and Mark had departed for home after our 10,000 Islands tour, Alan and I still had a day to do more paddling. After talking to a park ranger, we decided to paddle the "Left Hand" Turner River. This would take us up the Turner to a fork. The right hand would take us to a pull out at a park on US 41. I had paddled this route in 2006. It was one way and required a shuttle. 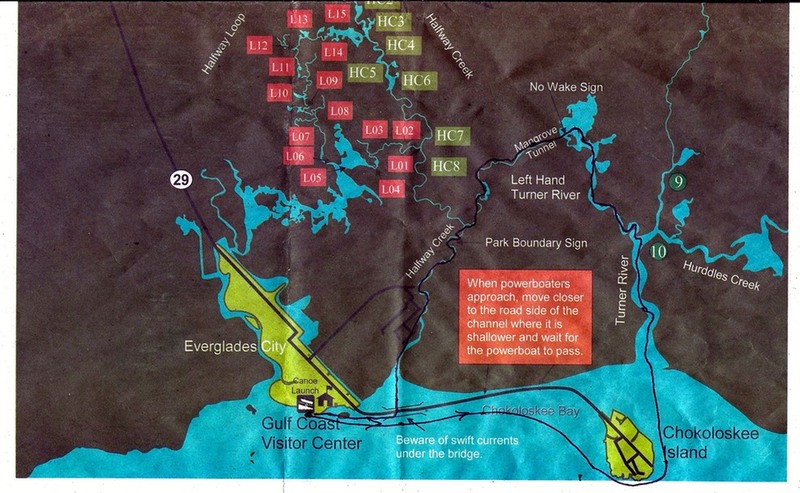 The left fork loops onto Halfway Creek and returns to the Gulf, a round trip that takes the paddler through some extensive mangrove tunnels. It's called the Left Hand Turner River route. For reasons I can't explain, I left my Top Spot chart behind. I relied instead on the handout material provided by the park service. That chart is shown below. 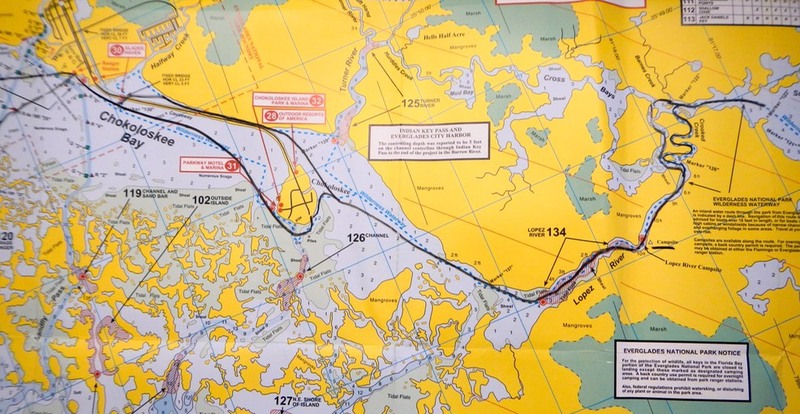 It only shows one river entering the bay behind Chocoloskee Island and the route we intended to take. 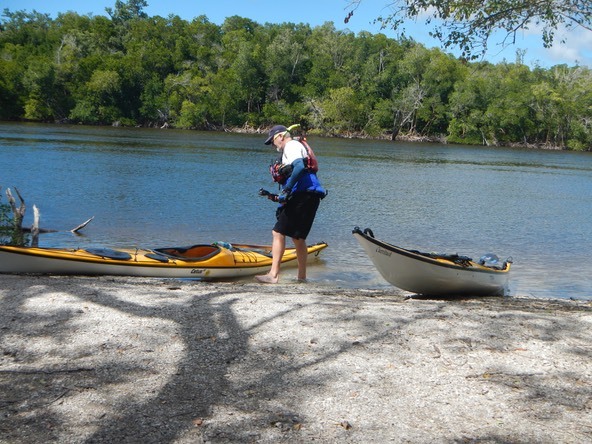 We put in at the national park canoe launch and decided to paddle in the Gulf, around Chokoloskee Island and up the Turner. This was our first mistake. We were expecting the rising tide to carry us upstream. But the paddle around Chokoloskee took much longer than we anticipated. There was little rising tide left by the time we entered what we thought was the Turner. Had we paddled under the causeway bridge which is much closer to the launch, we would have been across from the entrance to Halfway Creek and able to take advantage of the tide. Our next error was in not realizing that there could be two rivers flowing into Chokoloskee Bay. 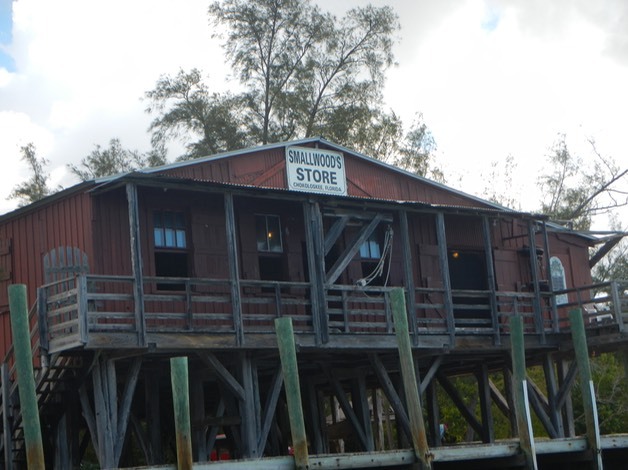 As we rounded Chokoloskee Island, we made a quick stop at Smallwood's Store, then headed toward where we expected to find the Turner. Our way was blocked by a huge oyster bar. It took some time to find our way around this obstacle, which apparently disoriented us. Once by the oyster bar we looked ahead and saw the entrance to a river, the only river in sight, that we assumed was the Turner, and up we went! As we paddled this river we kept seeing physical features that seemed to agree with the small map given to us by the ranger. On we went until we spotted a marked camping area. It wasn't on our map. We went ashore. 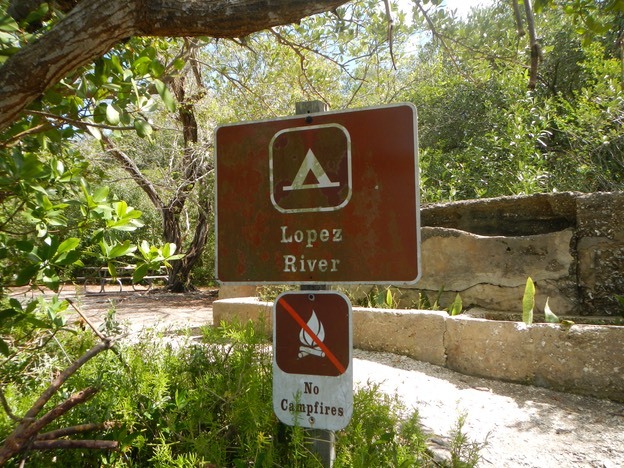 There were the remains of a settler's cabin and cistern there and a sign that read "Lopez River" and a campsite symbol. We assumed that this referred to the Lopez family's homestead and this campsite on the Turner River. On we went till we came to an open area that corresponded to a similar area on our little map. We started looking for the top entrance to Halfway Creek that was supposed to be behind an island, marked by a sign. We found an island and we found a sign, but no Halfway creek. We paddled back and forth in this large open area looking for that elusive entrance with no luck. When we could no longer make any sense of our physical surroundings in relation to the map, Alan did a very unmanly thing. He paddled up to some fishermen and asked for directions. That's when we found that we were on the Lopez River, miles from our intended route. How embarrassing! The fishermen did not make any jokes at our expense, but instead gave us directions to a short cut down Crooked Creek. A quick look at my GPS told me that we had already paddled twelve miles. We needed a shortcut. When we finally reached Chokoloskee Bay again we looked for the entrance to the Turner River. It is well hidden from most angles. It's no wonder that, not knowing there was a second river in the bay, we paddled up the river we could easily see. 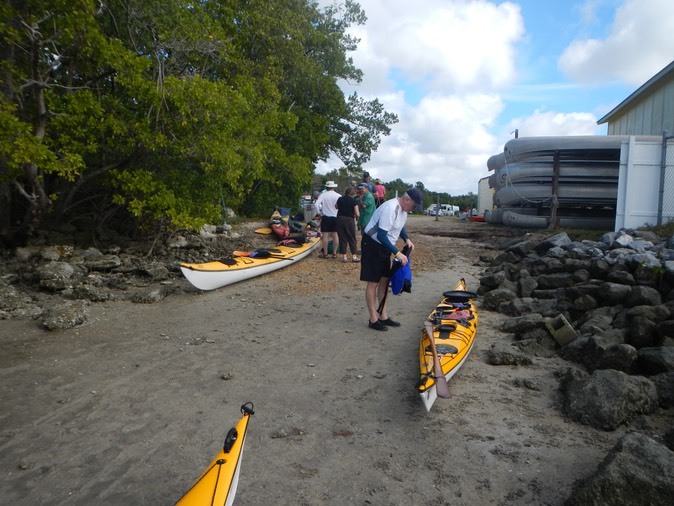 We paddled back to the canoe launch along the inside of Chokoloskee Island and it's connecting causeway. And there was the entrance to Halfway Creek across from the small causeway bridge. We were pretty pooped by the time we reached the canoe launch. We had paddled almost twenty-two miles! A quick look at my Top Spot chart clearly showed the Lopez River and the error we had made. The Route we actually took. Even with all the missteps it had been a great day of paddling. The weather was warm enough to be comfortable but still cool enough to enjoy. The scenery was great and it was fun to explore the Lopez River and campsite. But it was somewhat disconcerting to be so unsure, so tentative about where we were and how to proceed. Alan and I loaded our gear for our trips home. I power washed my boat and car. Then we headed to a nearby seafood restaurant for one more meal before turning in.